2015 started out busy and looks like remaining so for a while at least. 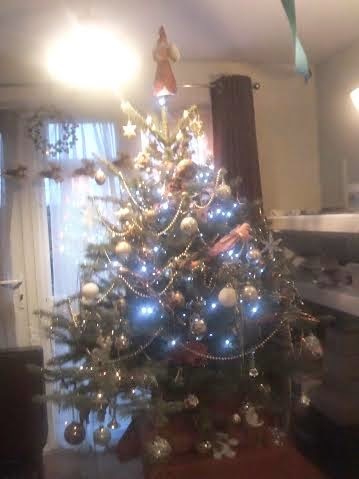 Christmas was quiet with just myself and Colin we had a real tree, the last one we will have as they are so expensive. I love a real Christmas tree but the cost means we will go back to our artificial one this Christmas. It looked nice though, we had a Nordic Santa as the tree topper. 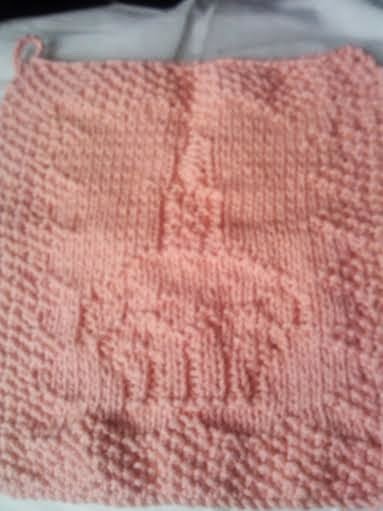 So January began and I have been busy writing and knitting. I write poetry and keeping a journal that has some of my thoughts and things I do in it and I am illustrating it as well. 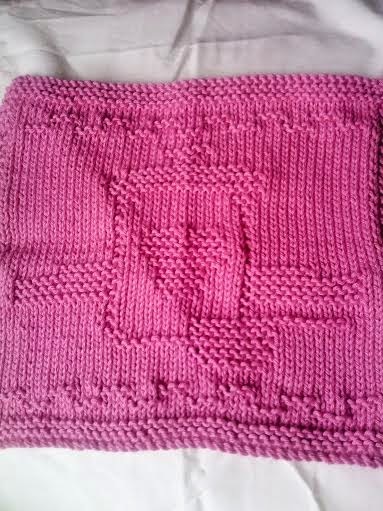 I am still knitting and have made myself something, a Cushion Cover. It is far different to many sites as it has teams that you can join and get support from the people on that team. I have made many friends there and we all support each other in our effort to get healthier. All the teams are themed to various things like: Hobbies and Interests, Age Groups, Lifestyle and Culture,Parenting and family and a host of others. Each team has various challenges that you follow if you want to and I have found it very helpful in forming a healthy eating plan. Anyway I belong to a team that is based on Hogwarts from the Harry Potter films. It is fun and has helped me find my creative side again. I am in Ravenclaw House and I wanted to create something to do with Ravenclaw and decided to make a Cushion cover in the colours of the House. Ravenclaw colours are Blue, Silver and Copper. So I set too and made a cushion cover using colours that were as close as possible to the colours I needed. 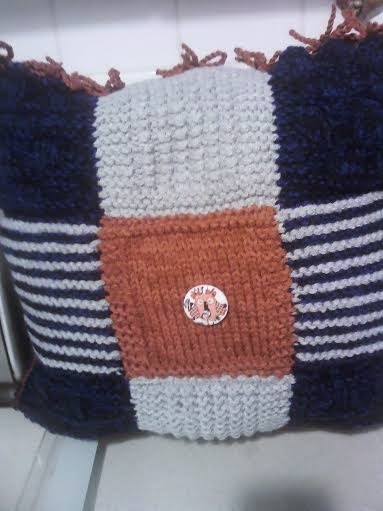 I used two strands of yarn held together to create a thicker material and knitted squares that I sewed together. 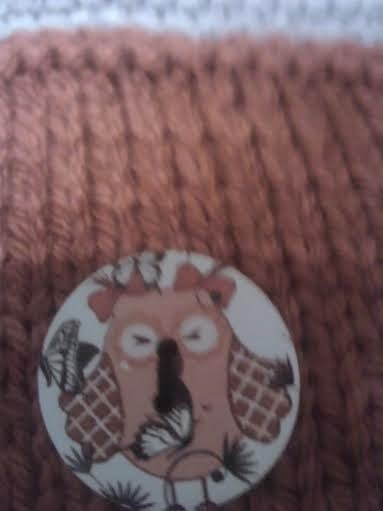 I added a button to the middle and chose an Owl as Hogwarts use Owls to deliver the mail. I used blanket stitch to sew the two large squares together in the copper colour and made ties to close the cover, that way the cushion pad can be easily removed when I want to wash the cover. 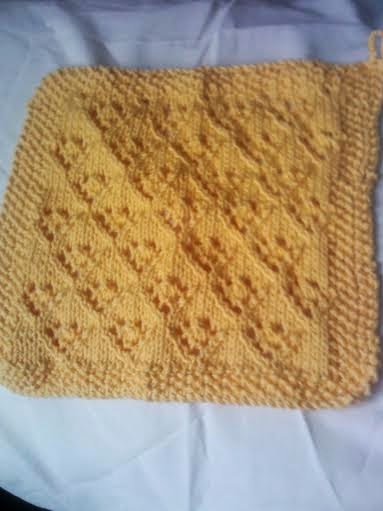 I have also made some Dishcloths for my friend in Texas as her birthday is in March and I need to post them early to make sure she gets them on time. All of these items were made for the Stashbuster Challenge on my Knitting team in Sparkpeople for January 2015. Keep knitting and have a happy and healthy 2015. 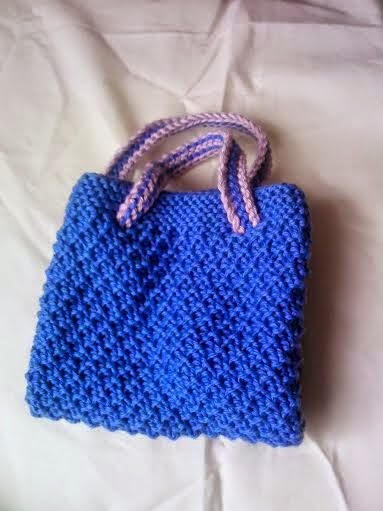 Hi and wow you made such pretty crochet creations Paula! Thanks so much for stopping by and leaving the sweet comment about my scarf that I'm knitting! Thanks for joining my blog too. Have a wonderful weekend.